how to get toothpaste out of shirt? We’ve all been there. You’re brushing your teeth, and a glop of toothpaste falls on your shirt. It’s not that hard to get toothpaste out of clothing, but you’ll probably have to use some soap. Act fast because toothpaste can stain clothing permanently if it’s not removed quickly. Scrape as much of the stain off as you can. It will be easier to remove the stainwith chemicals and water if you first scrape off whatever toothpaste will loosen up. Try using a small knife or sharp object to scrape off as much of the toothpaste as you can. If you are a child, only do this with parental supervision, however. Scrape only very gently so that you don’t end up damaging the clothing by poking holes in it. You are just trying to get the surface-level toothpaste off. Be careful not to rub the toothpaste too hard or you could embed it even more in the fabric. You could also try to use your fingers to pick some of it off if you are nervous about using a knife. The sooner you try to remove the toothpaste, the easier it will come off. If the toothpaste sits on the clothing for very long, it could erode the color in the clothing. Whitening toothpaste that contains bleach can damage the clothing especially if it remains on it for very long. Check the tags on the clothing. Many stain removal methods involve water. 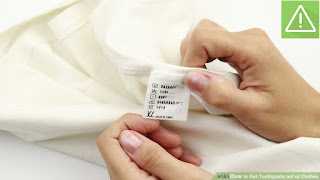 You need to make sure the fabric won't be damaged if water is applied to it. If the clothing is dry clean only, do not use water at all or it will leave a spot. If you don't have time to take the clothing to the dry cleaner, there are dry cleaning stain removal products that can be used on these pieces, though. 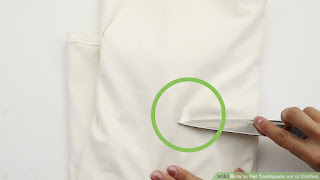 Moisten a soft cloth with warm water, and blot the stained area. This will help loosen the stain some more. Mix a few drops of laundry detergent with a cup of water. You can use stain remover in place of the laundry detergent. Try spot cleaning the clothing first. Dip the cloth in the sudsy water, and gently blot/scrub the toothpaste area. Once the detergent penetrates the toothpaste stain, the stain should release itself somewhat. Wet the area and put pressure on your shirt with the water so it comes out. If it still looks tinted white, then it is not completely out. The titanium dioxide powder causes the white staining on clothing. That’s why you will likely need detergent to get it out. Blot the area with water to rinse. Allow the spot to air dry. Don’t apply heat to it yet because heat can set the stain into the clothing. It’s possible that this is all you need to do. It depends on the nature of the stain. If the stain remains at all, you’ll have to wash the clothing more thoroughly. Wash the clothing in the laundry machine with regular detergent. 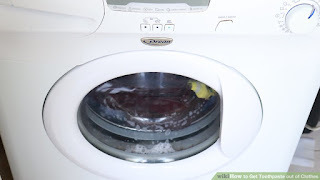 You should wash the clothing in a washing machine if the stain doesn’t completely lift after you try scraping and blotting it. 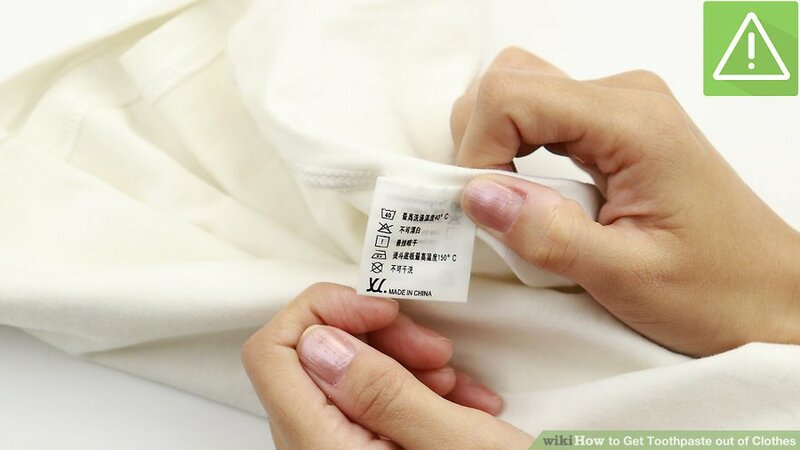 This is important to do if you don't want the clothing to be permanently damaged. If the piece can easily be placed in the washing machine and washed, that will provide the easiest and most thorough removal method. It’s usually a good idea to pretreat the stain with laundry pre-wash stain remover. Run warm water over the clothing or soak it in a bucket. Run the warm water from the back of the stain through the front. This should help pull the toothpaste out of the woof of the woven fabric. Gently rub the stain(s) with your finger under the water. Make sure the stains are out before you dry your clothing. Drying sets the stain into fabric more, making it tougher to remove. If the stain is still there, soak the clothing in a bucket of very hot water and some detergent for a few hours. Do not dry in the dryer; rather, air dry until you are certain that no remnants remain. If you detect remnants of toothpaste, repeat the process. Try using dish soap. 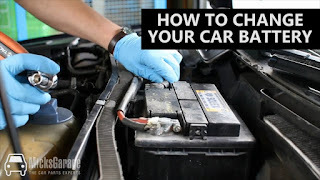 Remove the initial toothpaste and, once you are left with the residue that is worked into the fabric of your clothes, use dish soap and really scrub at the stain. First, scrape off as much of the toothpaste as you can. Let the soap sit for about 10 minutes, and then clean the garment as usual. Add olive oil into the soap mixture. Take a napkin and then gather some detergent, water, and olive oil. Pour the detergent and water together in a glass, and mix them. Then, take the oil, and put it over the stain. Don’t use too much oil or it could ruin the clothing. Pour the water mixture onto the toothpaste stain next. After a few minutes, wipe it off. You may still need to wash the clothing further in a bucket or washing machine. However, this should help remove the stain. Put lemon on the stain. Take a lemon, and cut it in half. Then, rub the pulp side on the stain for about one minute. Wash it off with normal detergent powder. You can also mix freshly squeezed lemons with baking soda, which is a natural remedy that is great to use for cleaning. Wait for the fizzing to stop. Once done, mix it again until it becomes pasty. Then slowly rub the mix on the stained area. Use one teaspoon of baking soda and two teaspoons of lemon juice. You could also try using rubbing alcohol on the stain. Put vinegar on the stain. Vinegar gets stains and foul smells out of almost everything. Wash a small load of clothes with a cup of vinegar or add some to your bucket of water. You can also pre-treat the clothing with vinegar if it’s super stained or smelly. Then, put it in the washing machine following the instructions above. It's best to use white vinegar. Mix one part vinegar with 2 parts water. Mix and apply to the stain. Let it sit on the clothing for about one minute. Then, blot it with a clean dry cloth. Rinse and launder.